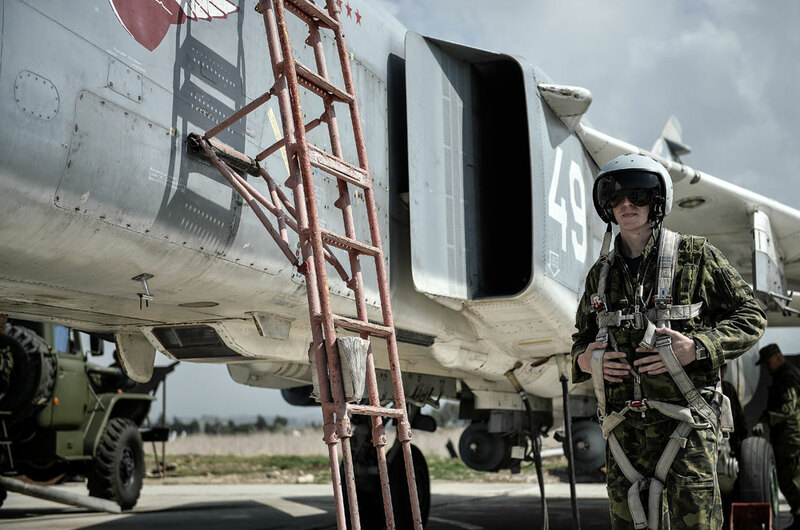 A pilot of the Russian Airspace Forces gets aboard a Su-24 multifunctional strike bomber at the Hmeimim airbase in Syria. Russia is withdrawing more than half of its fighters and bombers from Syria, while leaving its missile defense systems and naval fleet in the Mediterranean, Russian military experts told RBTH. Despite the pullout, the Russian armed forces will continue to strike positions Moscow says are held by ISIS militants. The Russian armed forces have begun to withdraw their troops from Syria following the surprise announcement by President Vladimir Putin on March 14 that Moscow was to pull out the majority of its forces involved in the Syrian campaign. According to military analysts, the group of Russian aerospace forces in the region will be greatly reduced, but the operation that Moscow claims is directed against militants from Islamic State and Al-Nusra Front will continue. "The number of sorties has dropped sharply, they are carried out mostly at night," Viktor Murakhovsky, editor-in-chief of the Arsenal Otechestva (Arsenal of the Fatherland) magazine and a member of the Expert Council of the Military-Industrial Commission of the Russian Federation, told RBTH. "But the truce in Syria does not apply to groups which are recognized by Russia and the U.S.-led international coalition forces as terrorist. The armed forces of the Russian Federation continue to carry out surgical strikes on the positions of ISIS militants," he said. On the morning of March 15, the first group of Russian fighters and bombers left Syria en route to their sites of permanent deployment, according to a statement on the website of the Russian Defense Ministry. The flights are being carried out in groups led by military transport aircraft (Tu-154 or Il-76), which transport engineers and technicians, as well as material and technical equipment. Pilots fly in such a group until reaching the Russian border, and then head for the airfields where they are permanently deployed. "Of the 60 fighters and bombers, more than half will be withdrawn, maybe two thirds," said Murakhovsky. "At the same time, the number of our troops in Syria will be reduced only slightly; this is necessary to ensure the safety of the permanent Russian military bases at the Khmeimim airfield and the port of Tartus." According to Murakhovsky, helicopter units will remain in their entirety to carry out search and rescue missions and tactical transportation in Syria. Russia is also leaving its military advisers to help the Syrian leadership in the fight against Islamic State militants. "Russia is leaving its air defense systems in Syria in their entirety – S-400 anti-aircraft missile systems as well as Buk-M3, Tor-M2 and Pantsyr S-1 air defense missile systems,” Viktor Litovkin, a retired colonel and TASS military analyst, told RBTH. “Also, Russian navy warships will continue to operate in the eastern part of the Mediterranean, to be rotated in the normal mode," he said. According to him, the navy is tasked not only with the control and surveillance of ISIS militants, but also with monitoring NATO warships, which come to the Black Sea with SM-3 and Tomahawk cruise missiles on board. "Moscow is initiating the peace process and following the path of the United States in Afghanistan by leaving its strongholds and their means of defense," Fyodor Lukyanov, editor-in-chief of Russia in Global Affairs magazine, told RBTH. "The pullout of the 'combat' part of the troops is also a signal to President [Bashar al-] Assad that Russia will not always solve Syrian problems in the international arena and that the current regime is now quite capable of independent political action." The ceasefire proposed by Russia and the United States has been in effect in Syria since Feb. 27. The truce does not cover militants belonging to the terrorist organization Islamic State (ISIS). The military operation of the Russian aerospace forces against positions allegedly held by ISIS militants in Syria began on Sept. 30, 2015.